Unfortunately we only had 14 days to travel around Norway. Since we traveled with our own car the Lofoten were too far away to accommodate them on this trip. So we had to limit ourselves on our road trip to the south of Norway. 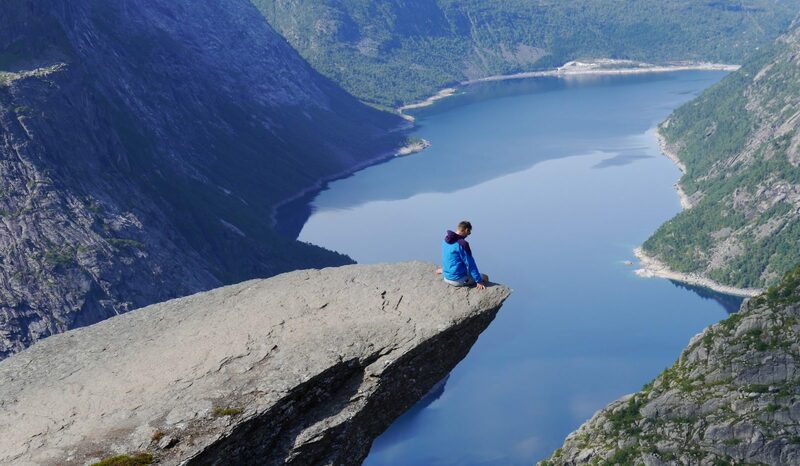 But with highlights like Trolltunga, Kjeragbolten and the Geirangerfjord, the south has more than enough destinations to spend a fun and varied holiday there. If you are planning such a trip, here are a few tips and our itinerary. Maybe it will help you with your vacation planning. How much money did we spend per person? How many kilometers did we drive in total? Altogether nearly 4500 kilometers! But only about 2500 in Norway. The remaining 2000 kilometers we have spent to get from Germany to normal and back. How many times have we stayed in the tent? Thank God we did not buy a new tent! Although we had planned to stay in the tent every other day, we only did it once. We are definitely not the born campers. Nevertheless, we have stayed up to 2 days (where we have rented an AirBnB) always on campsites. We drove almost 1000 kilometers from the western part of Germany to Hirtshals in Denmark. There is a large ferry port from which various ferry companies start to various destinations in Norway. We chose Fjordline (Hirtshals -> Kristiansand)…. which was not a good idea. Why exactly, you can also read in our tips and tricks article. The ferry costs about 100 € for 2 people and 1 car for one way and was 10 euros cheaper, because I registered myself in the Fjord-Club. No further obligations result through the registration. When we arrived around 8 pm, we drove on for another 30 minutes to our small AirBnB room in the tranquil Flekkefjord. From the arrival in the ferry port I was already impressed by the incredible nature. I never thought that the fjords and rocky landscapes start in the deep south of Norway. After this extremely exhausting hike, we made a stopover on our trip to the Trolltunga, otherwise we would not have made it all at once. We chose the Flateland campsite by accident, and this really turned out to be the most beautiful and idyllic campsite on our whole trip. 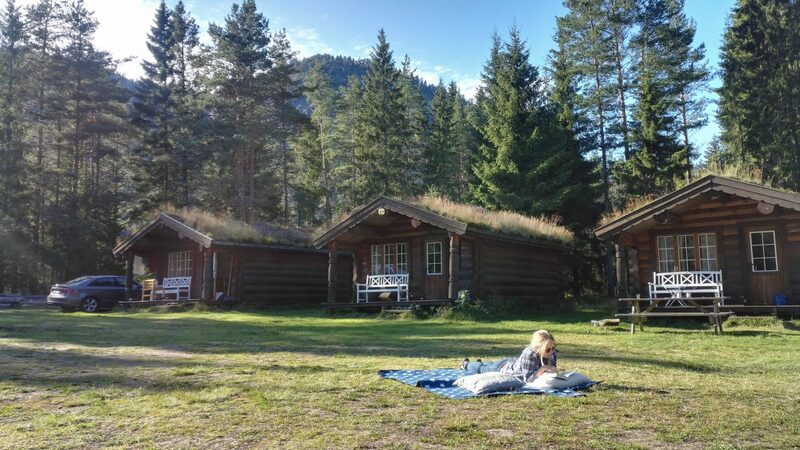 It is very suitable for families and (which is rather uncommon for Norway) relatively off the road. We rented a cabin there, which was pretty well equipped. In front of the huts there was a meadow, which was not completely occupied by tents, so that one could also spread out his blanket there. We felt so comfortable there, that we spent 2 days there. For a holiday where you do not want to be somewhere else every day and want to have a “home base” , this place is perfect. On the 4th day we made it to the devil’s tongue. This was the longest hike of our trip. The route itself was not the nicest compared to the rest, but at least the photo, which came out in the end is probably one of the most spectacular, you can get in Norway. We were really exited to hike to this huge waterfall. The hike is relatively short and if you have found the right parking lot you are pretty fast on your way to the Voringsfossen. The right place to park your car is coming from the east right here behind the tunnel. Then go either directly over the road and follow the small path or go on the right side of the road along the slightly larger path. This is a bit longer, because it still leads under the road, but by this way you do not have to cross the road. The rest of the way is well marked or there are no alternatives to take another way. 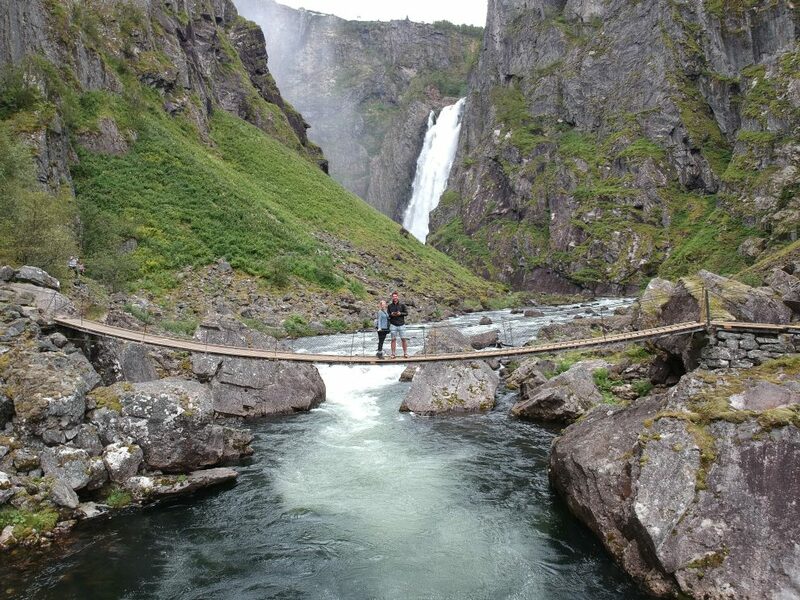 The highlight of the way is certainly the small suspension bridge that you have to cross to get to the other side. At the end of the path you can then go up a stony hill to get even closer to the waterfall. This climb is quite slippery due to the wet and you should be very careful. If you still want to see the Vossen from the top, you can (after your way back to the car) drive along the road a little further until the viewing point or a little more further to the big hotel. There is another viewing platform with a slightly different angle. For Bergen we had taken almost half a day of time. Since we are more nature loving people than city people, half a day was definitely enough for us. Worth seeing here is, of course, the district Bryggen right on the harbor. 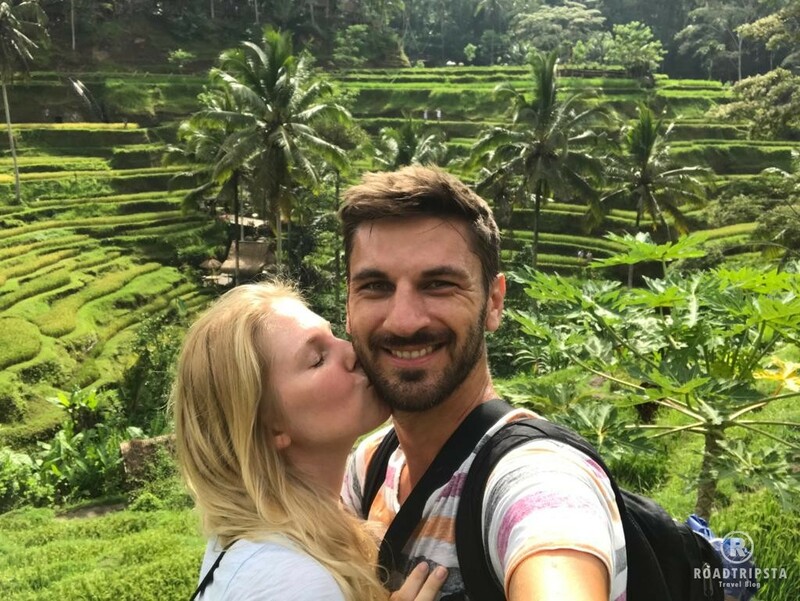 We were so shocked by the sudden culture shock due to the sheer masses of people on the ground that we did not stay much longer, but rather preferred to return directly to nature. The Naeroyfjord, the narrowest fjord in the world, is probably an part of any trip to Norway. All the more it surprised us that there is actually no place or real viewpoint right on the fjord. Since we did not want to make a boat trip through the fjord, we chose a small hiking trail to see the fjord from another perspective. This hiking trail was the Rimstigen(Link to Google Maps)! To get there, you simply drive left on the pier and then straight ahead, even if it looks like you should not drive along this way. Just before the road ends at a small farm, you have to park as close as possible on the edge of the road. From the parking lot it goes more or less steeply up the mountain with very beautiful views on the fjord. Unfortunately, we did not get any reliable information about the actual length of the trail. When after about 1.5h another a (much sportier) couple overtook us with the words that we had made it halfway up the mountain, we took a short break and then turned around. That was probably the right decision, because firstly, according to the local couple, the most beautiful views of the fjord arise anyway on the track we have already run. And second, we still had a long way to go and wanted to arrive before sunset. The Geirangerfjord is certainly one of the highlights in the south of Norway. But our route to the fjord started with a little detour. We took the Gamle Strynefjellsveg. The 27 km long National Tourist Route leads through beautiful and varied mountain landscapes and should be driven in any case. Tipp: We have seen some tents on the edge of this road. 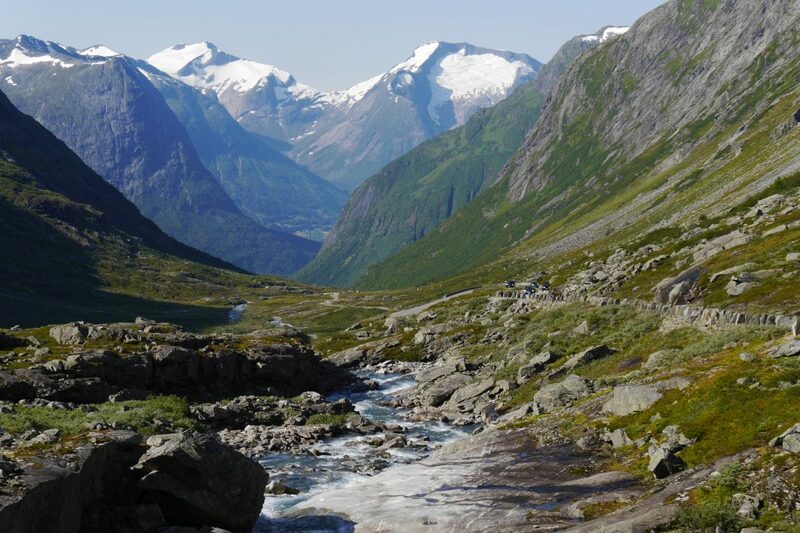 So it seems possible and also allowed to camp here near the Geirangerfjord. 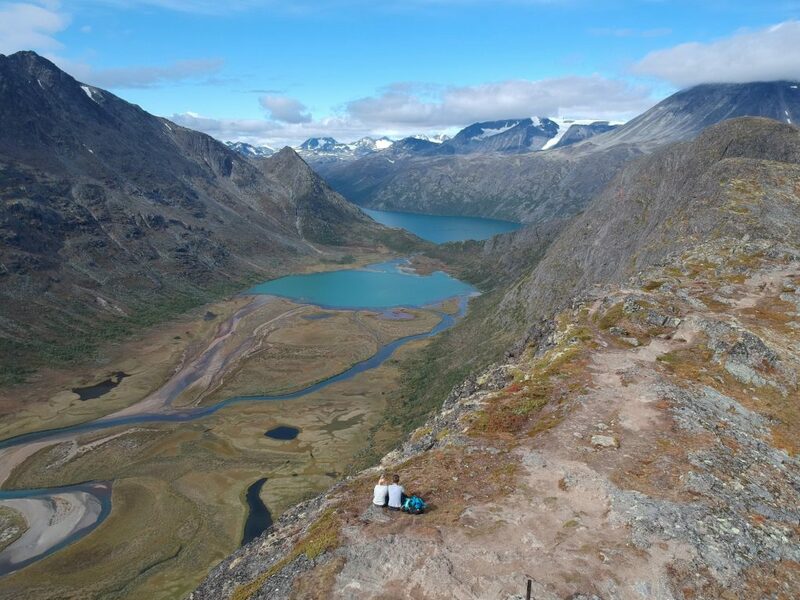 Otherwise it seems rather difficult to camp due to the landscape around the fjord. If you have crossed the pass road successfully you will inevitably pass another pass road leading to the summit of Dalsnibba . The way up is not quite cheap with 15 € per car, but the view from 1500 feet on the Geirangerfjord is unique and definitely worth it. To get a picture like this you just have to go past the toilets at this viewing point on the left and then keep left until you come to the abyss. There the photographer has to stand. The person to be photographed must then simply walk along the abyss until just before the boundary fence. On the 9th day we started the long drive to Molde to visit the Trollkirka. We had to take the ferry to Vestnes. Since the ferry did not drove on the two days before for maintenance reason, we spent about an hour in traffic. After an overnight stay in a hut on a campsite, we then made our way to the Troll Church. The parking lot is located directly on the main road. The cave is definitely worth a visit. After a short walk through the darkness (a flashlight is very helpful here) in the first cave you get to a small waterfall inside of the cave. To get to the second cave you can leave through a narrow gap of the first cave, and then descend again on a ladder. There is another waterfall to visit. If you have left this one can go even higher, where another cave should be. Unfortunately we did not find then third one. Supposedly this should be accessible through a hole in the ground. On the plateau above the 2 lower caves, a small wooden sign points to this third cave. With a bit of luck (and time) you should hopefully find it. We visited the Atlantic Road because it was not far from the Trollkirka. But unfortunately, this nearby road does not look as spectacular as in the photos. Basically, this street looks just exceptional from a special angle. When you drive along the road you do not notice anything of it. Therefore, we would not suggest to go there. This serpentine road was almost on our way to Oslo. And it’s quite a pleasure to drive up there. But I have to say that it is not as much fun as to drive up to Dalsnibba. On the top are several viewpoints and also a restaurant with a souvenir shop. In our opinion, you should have looked at this winding road. Especially the view through the valley from the top is very impressive. In the parking lot a sign is attached, that says something about a fee of 5 € in norwegian. Since there was no guard or anything else we could not imagine how to pay this fee, so we just parked our car. The path then leads first to the back of the mountain to run from there to the top on a steep way. We did not make it all the way to the top, because of the wind and the cold, but of course we really enjoyed the great view. On day 11 we only did a small hike on Huldigstigen (Google Maps Link) and afterwards chilled in our cozy wooden hut. 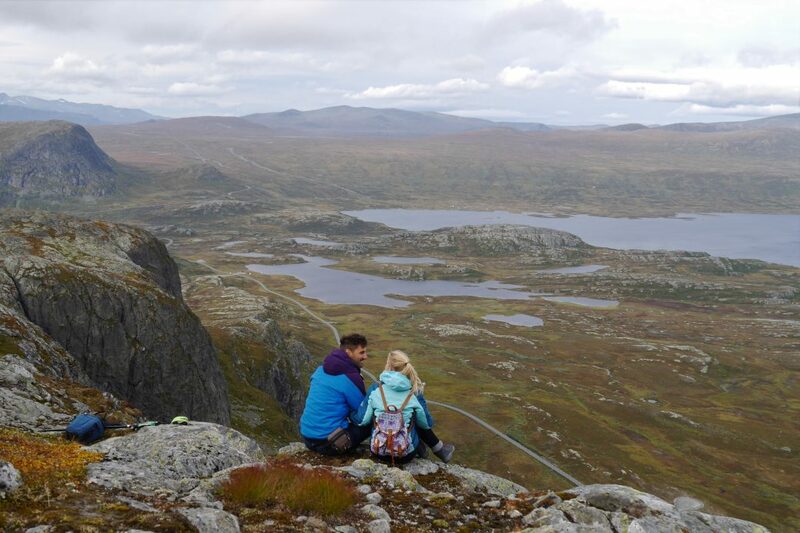 The Huldigstigen is a completely flat circular walk in the Jotunheimen National Park. We chose it because we needed something, that is not that much exhausting and this way was exactly right. This hike would also be perfect to walk with small children. On this hike you pass a beautiful lake and deep pine forests. In between, you also meet one or the other sheep and can write a note (Norway typical) in a guestbook. Who expects a spectacular hike over hill and dale, is certainly wrong here. But those who are looking for a relaxed walk through a very beautiful forest landscape should definitely not miss this hike. The next day we did our favorite hike: Knutshoe. On the 13th day we visited Lillehammer on the way to Oslo. Or at least the ski jumping terrain in Lillehammer. You can make a stop for that, but of course you do not have to. In Oslo, we got the shock in terms of human crowds again. And for the first time we stood in traffic jam (!!). So this day was a good preparation for everyday life at home. Apart from that, we did not like Oslo very much. If you want to buy souvenirs, the city center is naturally predestined for it. But you do not necessarily have to look at this city. A comparison to other Scandinavian capitals such as Stockholm, Oslo is not worth the visit. On the last day we took the ferry in Larvik (Colorline) to get back to Hirtshals. The Colorline ferry was a lot bigger than the Fjordline ferry. This also meant that it did not wobble and everything was quiet and pleasant. Inside the ship there were also restaurants and other shops. A really nice end to the our wonderful holiday. And after another 1000 kilometers we were finally back home. Are you looking for more tips for your holiday in Norway? 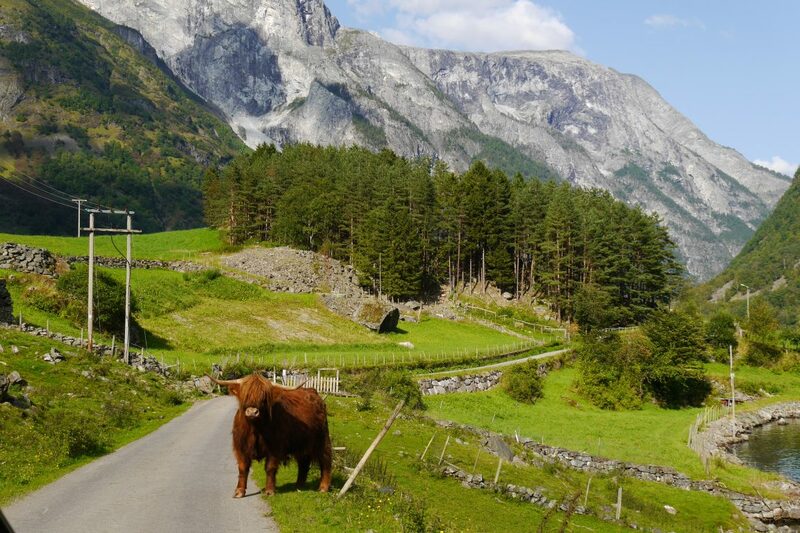 Check out our Tips for your Norway Roadtrip ! Do you have any questions or comments regarding Norway or our article? Write us a comment!